The last time I went to the Dekalb Farmer’s Market I did something outrageous–insane even. I didn’t buy any bread. This wasn’t a mistake. It wasn’t a slip-up. I did it on purpose. Because…well…because I have this insane idea to stop buying bread and to start baking it myself. You have to understand something though, the Dekalb Farmer’s Market Bread is the best in Atlanta for that price. Their golden pecan bread keeps me alive. And I didn’t buy a loaf. So I’ve been frantically (well, how frantically can you make bread sans bread machine?) kneading and baking, trying to make something satisfying. Unfortunately, I’m a big believer in the idea that one’s energy determines how good the baked goods will be, and since I was sick on Monday for the first loaf attempt (oatmeal bread) and in a self-induced selfish funk last night (whole wheat loaf), neither turned out very well. But the whole wheat loaf was the better of the two (thank god). As you can tell from the picture, the crumb is a bit dense (can the crumb be dense? I never know how to talk about bread). The entire loaf is dense. BUT not inedible! I like the whole wheatyness of it and it seems to work well with sandwiches thus far. Eh, I’ll get a good loaf one of these days. And I do love making bread, so it’s a nice challenge in between thesis writing and work. Dissolve the yeast in the water in a large bowl. Add honey, white flour and 1 cup of the whole wheat flour. Beat vigorously with a spoon to form a smooth batter. Cover and set aside to rise in a warm place for 40 minutes. Stir in the oil and the salt then fold in about 2.5 cups wholewheat flour, 1/2 cup at a time, turning the bowl a quarter of a turn between folds. When the dough is too thick to add any more flour turn onto a floured work surface and knead for 5-8 minutes, adding only enough flour to make a smooth elastic dough. Place the dough in an oiled bowl. Cover and rise in a warm place for about 45 minutes until doubled in size. Punch the dough down and leave for a further 35 mins or so to rise again. Shape the dough into 1 loaf and let it rise in the oiled pan for a further 30 minutes until doubled in size. Preheat oven to 350 F. Bake for about 1 hour or until browned. Remove from oven and turn onto rack to cool. Golden pecan bread? I must try! Of course your loaf looks wonderful. whole wheat can be challenging. you might have better luck starting with more like a 1/2 and 1/2 mixture with unbleached bread flour and working your way back up. also, i used to get dud yeast packets all the time until i just bought a bag of instant yeast. works well every time! Oh, bread! I started baking mine about a year ago, and it does get better…I don’t know what I do differently, though I do use different recipes…but even dense bread is yum! I’m so glad that you’re finally coming over to the healthier side. I want to try my hand at bread so bad! Lovely! This weather brings out the baker in all of us, doesn’t it? Homemade breads are the best thing since sliced… you know! Your bread looks fantastic – dense or not! Thanks for the recipe! Aw, well that still looks pretty good to me! And some of the worst homemade bread is still miles better than anything store bought, right? 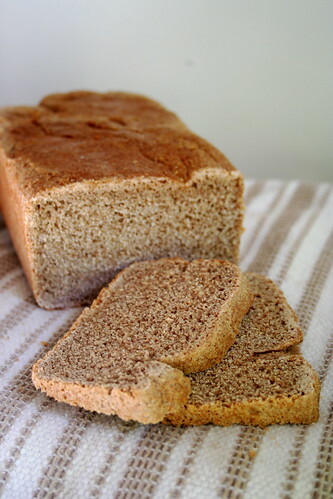 I made some ww oatmeal bread in a class and it was very dense, but yummy. maybe it’s supposed to be that way. I pretty much love all bread. dense, not dense, you name it. golden pecan does sound wonderful. I think it looks awesome, love the square shape. I never have the patience to make sandwich bread, so really this is hugely commendable. wish I could smell it! this is the second time i baked bread. the first time was a disaster. this was an easy recipe and had wonderful results! im so happy!